Categories: Adi Shankara, Jagannatha, Puri, Rath Yatra. 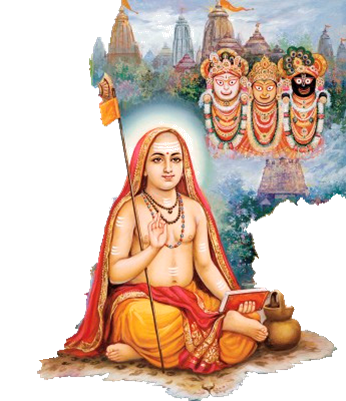 Sri Adi Sankara’s name is etched in the history of our religion for reviving the Sanatana Dharma and establishing the philosophy of Advaita. His commentaries on the Brahma Sutra, the Bhagavat Gita and the Upanishads, not to mention the numerous ‘Prakarana Granthas’ (supporting works) establish without doubt the philosophy of Non-dualism – One without the other. Contrary to popular belief, the philosophy does not preclude the tender and gentle expression of love for the Supreme, and Sankara’s own works are standing corroborations to this. 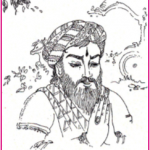 Many of his slokas exude Bhakti in the most astonishing of dimensions. One such example is his ‘Jagannathashtakam’ (octet on Jagannatha). Puri is a coastal temple town located at the foothills of the ‘Nilachala’ on the Odisha coast. Shri Jagannatha (Lord Krishna) is the presiding deity of the kshetra, along with His brother Lord Balabhadra and His sister Subhadra. The deities are ‘daarumayi murti’ (made of wood). The colossal Jagannath Rath Yatra of the deities happens during the Aashada month (June-July) every year. Adi Sankara visits the Jagannatha Kshetra. He is mesmerized by the sweet notes from the flute of Jagannatha-Krishna, who is playing it on the banks of Yamuna. In the second verse of his octet, Sankara describes the enchanting form of Jagannatha – who holds a flute in his left hand, sports a peacock feather on his head, wears a golden yellow silken cloth and enjoys divine pastimes in Vrindavana. 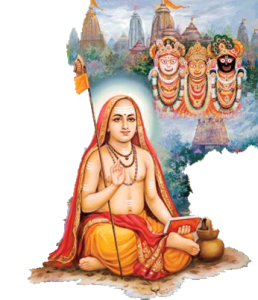 Sankara beholds the beautiful sight of the Lord along with Balabhadra and Subhadra in this temple town and extols His glories, and virtues of mercy and compassion in the verses of his Ashtakam. 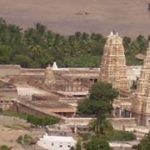 Adi Sankara happens to witnesses the grand ‘Rath Yatra’ at this holy place, where oceans of devotees are submerged in the ocean of His grace as the divine trio majestically ride in the chariot through the street. His bhava reaches new heights when he experiences a rare divine vision during the ‘Rath Yatra’ – Radha Devi riding the chariot along with the Lord during the Yatra! Sankara sees that, being from a rustic background and a novice in riding on chariots, Radha Devi is gripped with fear as the chariot speeds up. The Lord comforts her with His loving embrace as the Divine couple ride the chariot. Having witnessed this divine sight, Sankara wishes for nothing else: no kingdom, precious gems, family or material pleasures. “Pray Lord Jagannatha be the constant object of my vision forever,” implores Sankara in every verse of his octet! 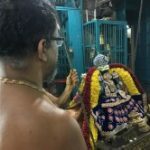 One Response to "Sri Adi Shankara Bhagavatpada’s Bhaava"
Yes, it is the supreme truth. Adhi Shankara’s each and every composition tastes ‘sweet to the core’. If one recites the slokas they can experience this. Rhythmic and serene and brings the Deity in front of us.